Shreena Bhakta dressed up with her fellow Delta Zeta sisters as cows during their sisterhood retreat. Bhakta made an effort to attend every event she could, Glava said. Photo courtesy of Mackenzie Glava. Shreena Bhakta, a member of the women’s golf team and a sister at Delta Zeta, passed away in her Northside apartment on Jan. 31. 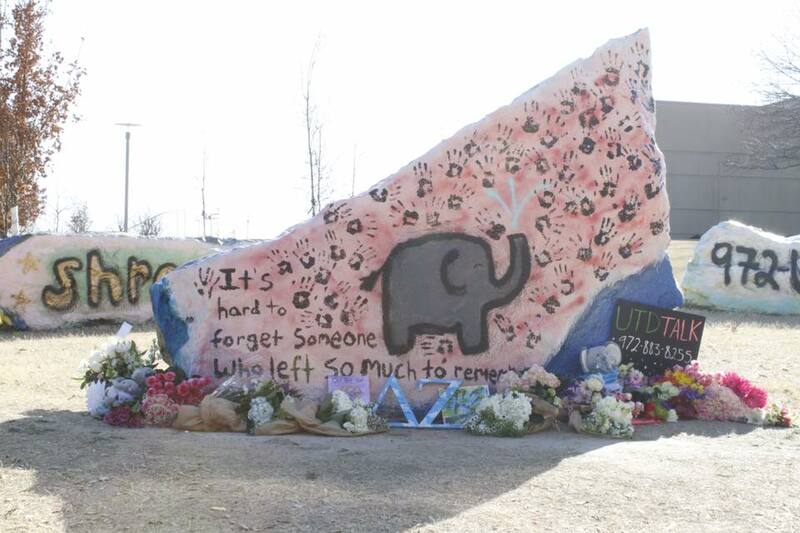 In remembrance of the EMAC sophomore, Delta Zeta painted the spirit rocks with an elephant on Feb. 5. Elephants were Bhakta’s favorite animal, said marketing junior Mackenzie Glava, who serves as Delta Zeta’s president. Members of the Delta Zeta sorority painted the spirit rocks in honor of Bhakta’s passing. Paintings include handprints from each sorority member, as well as an elephant, Bhakta’s favorite animal. Photo courtesy of Mackenzie Glava. The sisters of Delta Zeta are helping each other through their grief in the wake of Bhakta’s passing, Glava said. Bhakta actively attended sorority events, including turtle dates – named after the sorority’s mascot – where sisters socialize with each other. “She truly made an effort to come to every single one, to just be there for anyone that needed it and just have as much fun as she could with the people that surrounded her,” Glava said. In addition to her commitment to Delta Zeta, Bhakta played with the UTD women’s golf team. Bhakta was completely deaf in one ear and partially deaf in the other. She was the only deaf golfer at UTD. “The fact that she had to overcome being deaf at birth is a tribute to what she was able to do, and to come to this school, of all schools, to come to play sports and to get her academics speaks volumes,” Athletic Director Bill Pettit said. In her time on the golf team, Bhakta was on UTD’s Top 10 36-hole tournament list and represented the Comets as one of the three golfers sent to the 2017 ASC tournament. Pettit, who led the athletic department in hosting an open forum with student athletes in the wake of Bhakta’s passing, said she was a good teammate and a good representative of UTD athletics. Bhakta would go out of her way to meet new people and be kind to them, Glava said. She was also caring with her friends. “One of my favorite memories is that she would never let go of a hug first, and she always gave the best hugs,” she said. In her honor, Delta Zeta hosted a fundraiser on Feb. 8. The proceeds will be used to start a scholarship in Bhakta’s name to send a child to the Callier Center for Communication Disorders’ summer camp.